Steve Trader, head pastor of the Trinity Community Church, in front of what will become the new home of the church on Lancaster Pike. Since its beginning in 2005, the Trinity Community Church has become one of Hockessin's most inclusive, kindhearted and increasingly growing group of nomads. During that time, The Well on Lancaster Pike has served as the official headquarters of the congregation, and on Sundays, they conduct two services at the Wilmington Christian School, but what had originally been the mission of five area couples to bring a community-based place of worship to the people of Hockessin is now developing the happiest problem imaginable. It was running out of room. Its congregation, which when the church began numbered about 30, had grown to close to 400. Its calendar of student groups, support counseling, outreach programs, coffeehouse concerts, mission trips, and Bible study groups had galvanized the church's mission, but forced several programs to be conducted at other locations. 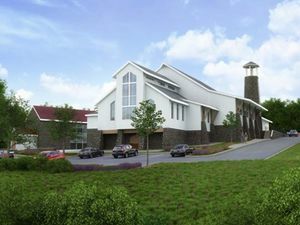 The 26,000-square-foot church will feature a 500-seat worship center, with adjacent offices, a student ministries facility, a children's area, a coffee house and walking trails. A major home construction company had expressed interest in building a community there, and yet another building entity had proposed to build a 55-and-over community on the property's 16 acres. Most recently, the Odyssey Charter School had made plans to construct a 225,000-square-foot school there, but in 2014, the school withdrew its plans, and sold the property to the Trinity Community Church. Enter the miracle – and mystery – of divine intervention. A few years ago, a real estate representative from a well-known Delaware restaurant entered the Well, and approached Trader to see if there was any interest by the church in selling the popular location to the restaurant. Although Trader turned down the possible sale, the two began a conversation. The representative told Trader that, about one mile up Lancaster Pike, what was now the abandoned and disregarded former home of the first Catholic church in Delaware – purchased in 1772 at the order of Father John Lewis, a missionary – was now hot property. With a mission of completing construction by December 2017, the new home of the Trinity Community Church will be 26,000 square feet in size, and feature a 500-seat worship center, with adjacent offices, a student ministries facility, a children's area, a coffee house and walking trails. Funding for the church has come from the Assemblies of God and parishioners. Now in Phase 1 of construction, the job is to stabilize the original stone barn – most of which still stands – and incorporate it into the design of the church. The barn's restoration is scheduled to be completed by the end of July. Once it is fully stabilized, construction will begin on the worship center. Trader said that the church's design not only incorporates history, but it's being done in conjunction with many meetings the church has had with neighboring communities. Both parishioners and the general public are invited to attend three July events on the church's new property. On July 13, the church will hold a Kids Night; on July 17, a special service to dedicate the barn will be held, and include a pre-service breakfast, followed by a picnic after the service; and on July 20, there will be live music and food provided by Big D's BBQ, and ice cream from Palateria Y Neveria. Trader gave credit to five families for not only helping to create the Trinity Community Church, but continuing to champion its mission: Paul and Mia Burch; Ward and Debbie Keever; Zach and Reny Koshey; Jim and Danielle Sipala; and Neil and Ann Marie Taylor. “These are five families who, when my wife and I were having doubts about creating this new church, gathered around us,” he said. “They are five solid couples who, without their sacrifice, this church would have never happened. To learn more about the Trinity Community Church, visit www.TrinityChurchDE.com, or call 302-234-8007.